The financial system provides three key services: payment services, intermediation between savers and borrowers, and insurance against risk. These services support the allocation of capital, and the production and exchange of goods and services, all of which are essential to a well-functioning economy. While the basic financial services are relatively timeless, the characteristics of the system providing them change continuously, in response to both economic and regulatory developments. 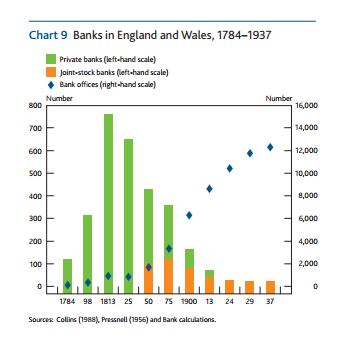 This article tracks the evolution of a core component of the financial system in the United Kingdom, the banking sector, describing how technology has transformed the economics of banking, and how deregulation in the 1970s and 1980s freed banks to take advantage of new opportunities through globalisation and financial innovation. The result has been the emergence of large, functionally and geographically diverse banking groups. Post-crisis, public-policy attention has been focused on the costs of a banking sector dominated by large and complex institutions that are seen as too important to fail.